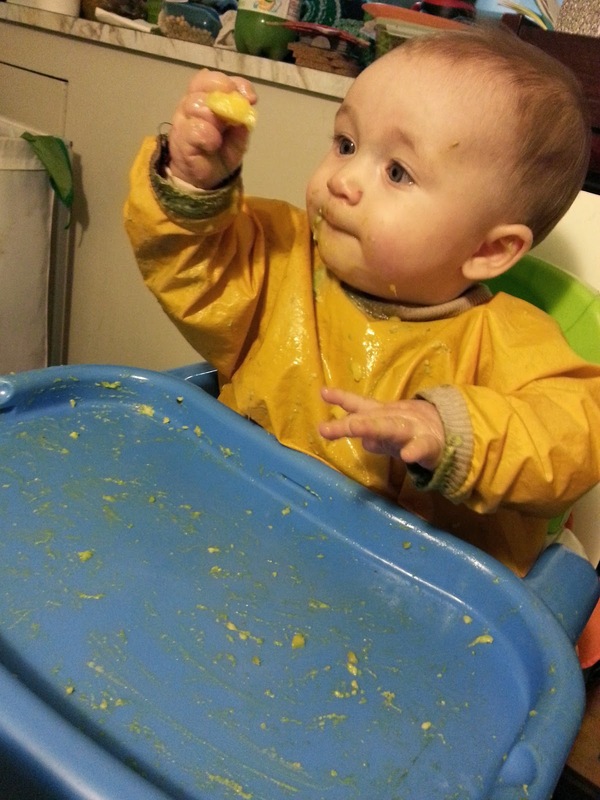 6 months: "Yam! Get in mah belleh!" 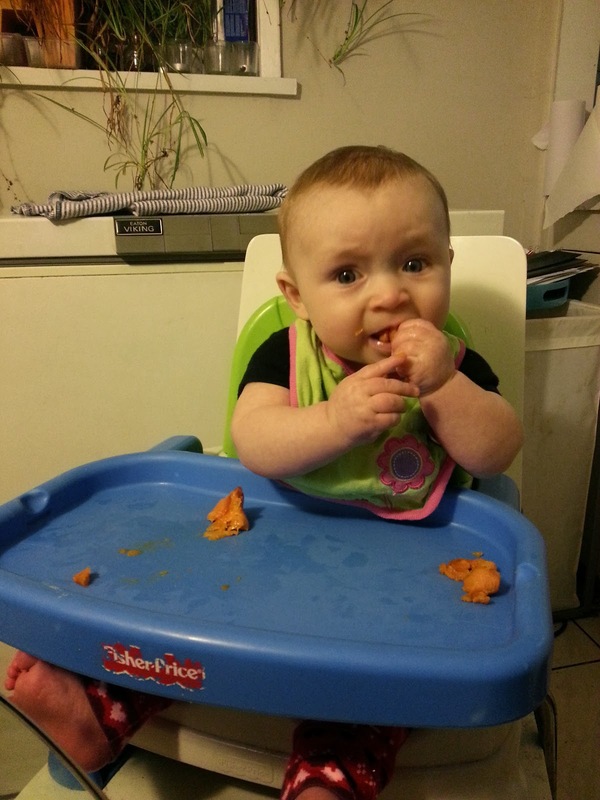 This past month we've all been obsessed with food, as baby B has tried eating all kinds of things. So far she's loved broccoli, cauliflower, carrots, yams, cantaloupe, bananas, chicken, pear, apple, avocado, potato, cucumber, egg, kale, pancakes, potato, quinoa, pork & beef meatballs. Oatmeal, cod & chicken were not huge hits--the oats were just too sticky & textured for her to manage & gumming doesn't really cut it with chicken or fish. Much like her brother, she's taken to eating right from the get-go, eating large quantities of nearly anything we put in front of her. She'll eat half a banana & look for more, or an entire carrot, half an avocado, several new potatoes. She stuffs things into her mouth as if she's starving, managing to mush up most things with her gums--still no teeth yet--& gagging very little. From my recollection of how Linnaeus was at this stage, she's eating as much, stuffing in big pieces like he did but gagging less than he did. She has seemed so interested in food that we've moved to two meals a day a week ago already. It's been fascinating to watch her go from full-fist two-handed feeding to single hand sometimes. She's gotten better at managing slippery foods & has figured out how not to squeeze too hard so she doesn't squish softer foods right out of her hands. Her pincer grip is developing too & she's able to consistently grasp & eat small pieces of food that are the size of a small grape. I suspect all the breastfeeding & eating is connected with how active she is. Bronte started the month pushing her chest off the floor when on her belly, then quickly moved on to pulling her bum up too, staying on all fours for a minute or so, rocking back & forth trying to figure out how to move. She's even starting to one or both knees forward just before falling back to her belly. She rarely stays put on the floor, rolling onto her tummy & pushing backwards with her arms or spinning around. Pretty sure she'll be crawling by the next monthly update. Another thing she's been doing a lot of for quite a while is hair grabbing. I know most babies do this, but she really seems obsessed by it. She goes after my long hair if it's down, her brother's close-cropped 'do if she can get a handful when he's close, or you'll often find her chubby little hand up at the side of her own head, running her fingers through her hair with a big smile on her face. However, it's not just head hair--whenever her Papa picks her up, her fingers go straight to his beard, or if she's on his lap, his fuzzy arm hair. Having seen one baby go through most of these stages before, I feel like I can make better predictions about what she'll be like as a toddler. I'm positive she'll crawl & walk sooner than her brother did--I'm guessing she'll be crawling by eight months & walking around a year old. She's also pretty vocal, so I suspect she'll be talking early like Linnaeus did.